The number of Safe Zones allies has increased at Wits University. 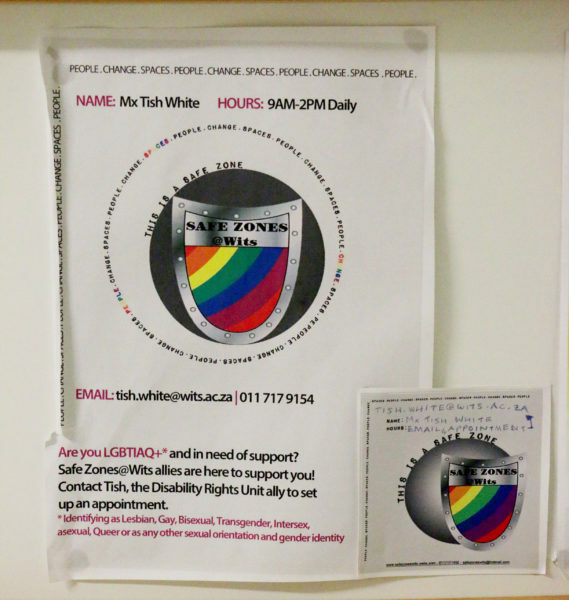 The number of individuals trained to provide safe zones for members of the LGBTQ+ community at Wits University has increased to 160. This is due to a reconfiguration of the programme, started in 2011, to provide support around sexual and gender-related issues. We know top-down approaches, of having one manager in an area to deal with all LGBTQ+ members, don’t work. These approaches cause power divides and people feel alienated or discriminated against. So we saw the need for a different approach,” said Tish Lumos, the Safe Zones Programme Co-ordinator. “People can change spaces and make them safer, it doesn’t have to be one person at a high level, and it can be anyone,” they added. According to Lumos, faculties and departments suggest the names of staff that want to be allies and once twenty people are available, a training session is conducted. The allies have been effectively trained by the ten student trainers and Lumos, to offer support and solidarity to members of the LGBTQ+ community. Allies are not put through a screening process, Lumos states that it would not be right to turn individuals away from being allies. People can sign up at Orientation or contact Lumos privately to become an ally. Sofia Kouridis, a member of the core organisational team and an Honours in Translation and Linguistics student, spoke to Wits Vuvuzela about what the Safe Zones offer students. “Spaces like this give people access to mentors as well as recommendations such as where to find LGBTQ-friendly institutions like healthcare, places of worship and recreational spaces,” Kouridis said. A Safe Zone sticker. Photo: Elizabeth-Jane Ringrose. All Safe Zone allies can be found on the Safe Zone website here, in order to find your closest ally. Their email addresses are listed to make an appointment. Every ally has a Safe Zone sticker, as shown below, on their door that shows that students can enter the space or alternatively email the ally in order to make an appointment. 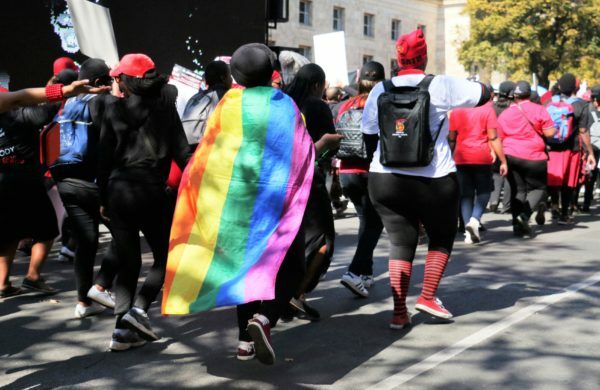 FEATURED IMAGE: The LGBTQ+ flag is worn as a cape during the #TotalShutDown march. Photo: Elizabeth-Jane Ringrose.